Sorbet is a light and refreshing posy of lush tropical flowers attractively arranged to brighten a special person's day. 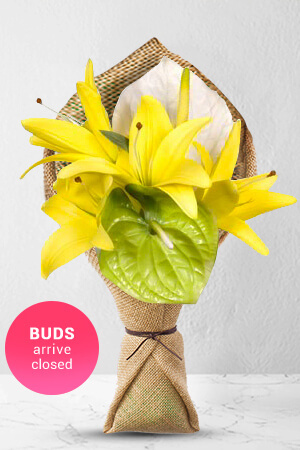 Great for decorating small areas.Lilies may be sent closed/partially closed in order to prevent damage and to last longer.Vase not included however, for a lasting impression we recommend you order a Standard Vase as the ideal addition to your gift. We hv been with zfowers for some time now and every time we hv a wonderful experience in terms of receiving order online, execution of order and the quality of supply. We always recommend to people to go ahead and experience. Easy to order online. Great selection of choices. I believe the recipient loved the flowers. easy to find on the net and quick.hope they were delivered yesterday. I like having the reminder each year for my friends birthday. I sort of wish we could get a photo of where being sent though. Very efficient service and flowers delivered same day. I love getting an email to remind me to send flowers to my friend.